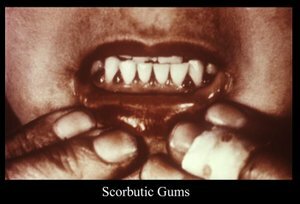 In infants, scurvy is sometimes referred to as Barlow's Disease, named after Sir Thomas Barlow (1845-1945), a British physician who first described it. Barlow's disease is different from Barlow's syndrome. Scurvy is also known as Moeller's disease and Cheadle's disease. It takes about three months of vitamin C deprivation to begin inducing the symptoms of scurvy. Untreated scurvy is always fatal, but since all that is required for full recovery is the resumption of normal vitamin C intake, death by scurvy is rare in modern times. Scurvy was probably first observed as a disease by Hippocrates. In the 13th century the Crusaders suffered from scurvy frequently, and it has inflicted terrible losses on both besieged and besieger in times of war. Scurvy was one of the limiting factors of marine travel, often killing large numbers of the passengers and crew on long-distance voyages. It even played a significant role in World War I. However, it was not until 1747 that the treatment and prevention of scurvy by supplementation of the diet with citrus fruit such as lemons and limes was introduced into the British Navy by James Lind. The plant known as "scurvy grass" acquired its name from the observation that it cured scurvy, but this was of no great help to those who spent months at sea. During sea voyages, it was discovered that sauerkraut was of use in preventing scurvy. In the Royal Navy's Arctic expeditions in the 19th century, for example, it was widely believed that scurvy was prevented by good hygiene on board ship, regular exercise, and maintaining the morale of the crew, rather than by a diet of fresh food, so that Navy expeditions continued to be plagued by scurvy even while fresh meat was well-known as a practical antiscorbutic among civilian whalers and explorers in the Arctic. At the time Robert Falcon Scott made his two expeditions to the Antarctic in the early 20th century, the prevailing medical theory was that scurvy was caused by "tainted" canned food. It was not until 1932 that the connection between vitamin C and scurvy was established. Scurvy in Children Tamura Y Welch DC, Zic JA, et al. : Scurvy presenting as painful gait with bruising if? a young boy. Arch Pediatr Adolesc Med 2000,154/7).,732-35.